What you say when you react to something before you have a chance to think reveals a lot about you. What do you say when someone bumps into you, or when you can’t hear someone speak, or when someone tells you about their bad day? Do you say “sorry” when things were not your fault? What else in life do you blame yourself for that wasn’t your fault? You can be polite without saying that you’re sorry for things you didn’t do. Sorry is a strong word that means the most when it’s used when it should be, not just as a reaction. Do you say “sorry” when things were not your fault? What else in life do you subconsciously blame yourself for that wasn’t your fault? You may think, well, that’s just polite to say sorry, but can’t you be polite without blaming yourself for all your world’s problems? 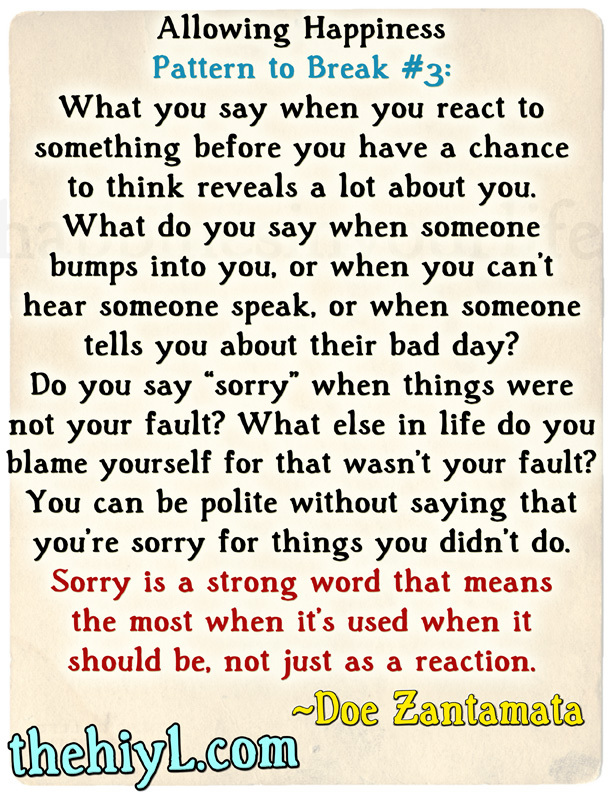 Think of people you know who say sorry in every other sentence. Do they seem polite, or do they instead seem very insecure, and uncomfortable with themselves in the world? There is a better way to be polite. - Well, at least it’s over. – or – If you need help, I’m here. – or - Good thing you made it through. Those alternates may not seem like a big deal, and it’s true, they’re very subtle when you just look at one or two. But when you say them hundreds, or even thousands of times throughout the course of regular life, you’re subconsciously assigning blame to yourself for things that you did not do. “Sorry,” means to do something on purpose or by accident that you regret and won’t do again. Can you really prevent accidentally bumping someone, or not being able to hear someone, or someone having a bad day? Saying sorry in these situations sets up a struggle between your conscious and subconscious mind of being at fault for things and not being able to prevent them from happening again. That does not inspire much security or confidence in one’s self. My terms on "Sorry". Sorry is a Statement, "I will never do it again" is a Promise, and "How can I make it up to you,/me" is Taking real action. thanks for posting the link on my FB page, I hope a lot of people come visit. I'll also share it tomorrow, as it's well worth a read. Wrong. You condemned the other one "without trial". Things should have been explained and closure sought before the the "goodbye". On saying "I'm sorry" ... Saying so does not always mean one is at fault. It can also mean that he values the relationship more than determining who is at fault. The issue now is the value placed on the relationship and not the fault.